Who doesn’t love gadgets? I sure do. 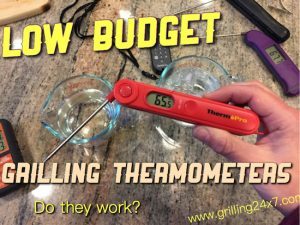 When my friends at Char-Broil asked me to review the Gear Trax system I jumped at the chance. 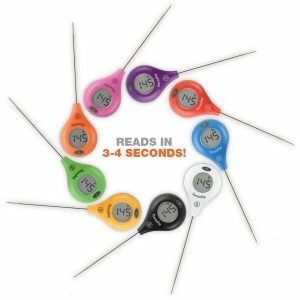 The Gear Trax system is designed to easily attach to the Char-Broil Commercial Series, Gourmet Series, and Classic Series gas grills. See those little holes on the grill in the photo above? 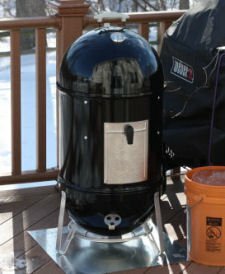 They are positioned all around the side and back of the Char-Broil grills and they allow attachment of the Gear Trax system to the grill. 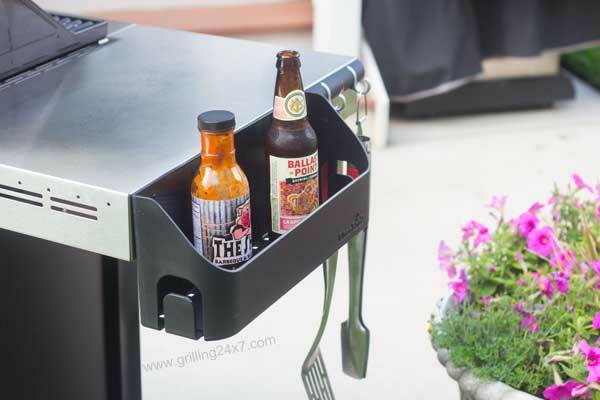 This allows for easy, universal mounting to multiple locations on the grill. The Gear Trax items I am going to review here include the condiment basket, the tool hook bars and the paper towel holder. I’m going to start with my favorite. The condiment basket allows you to hold quite a bit of stuff on the side of your grill. I’m sure the intention is for condiments, but it works for holding all sorts of stuff. One thing I noticed when grilling on a gas grill in the sun is that the metal side shelf of the grill gets really hot. Who wants to sit their cold beverage on a hot surface? Not me. Hey, put it in the condiment basket. The photo above shows my condiment basket holding a bottle of BBQ sauce as well as a fresh craft beer. Later on during that cook I managed to put a whole bag of hamburger buns in there too so the plastic bag wouldn’t get too hot. It was about 100 degrees outside and I’m sure the side of the grill was a lot hotter than that. Very nice. I don’t know about you but I make a mess when grilling. Usually that mess ends up residing on my shorts or t-shirt. 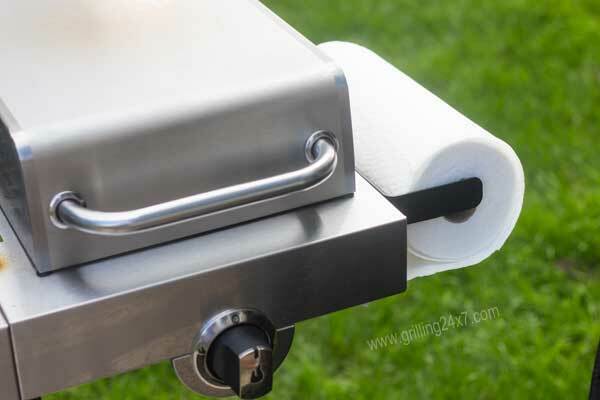 Whenever I brought a roll of paper towels out to the grill I would knock it over and lose track of it. It didn’t workout. The Gear Trax paper towel holder solves this problem by a small paper towel roll holder which attaches through the Gear Trax system. Those little holes I discuss above allow for easy attachment of the paper towel holder. You can’t lose your paper towels now. We all have an assortment of tongs, spatulas, forks and other grilling utensils that we can’t live without. 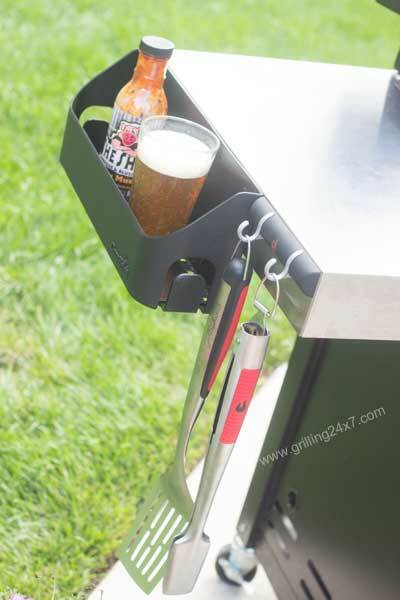 Why sit them on top of the grill when they can easily attach to this tool hook bar? If you are about organization and neatness, this one is for you. In the front right of the photo below you can see a small attachment that includes two hooks for hanging utensils. Most utensils have hooks or some method for hanging. This way your stuff can hang easily on the side of your grill and be ready to flip that steak at a moments notice. The tool hook actually comes with two pieces, allowing for four hooks to be used. I chose to only use two of them so I could attach it next to the condiment basket. Is gear trax any good? Yes. I think this system is very nice. The assembly can’t be any easier. As I mentioned, the holes on the side of the grill allow you to attach the component and then the provided hardware easily secures it on the underside of the grill shelf. It’s simple. My favorite aspect of this is that my drink, sauces and other items don’t have to sit on a viciously hot metal surface while cooking. I like how the items can sit on the side of the grill allowing more space for a plate or cutting board. It is certainly handy to have napkins readily available and my wife thanks me for this, as her time spent scrubbing my stained shorts is dramatically reduced. As a disclaimer, Char-Broil sent me the Gear Trax system to test out. Is The New ThermoPop a Game Changer?